Two weeks and I'm still alive…I can't believe it either. TWO WEEKS! My little Kindergartener is already one eighteenth of the way through Kindergarten. To me that means time is just going by way too quickly. I'm loving spending all this one-on-one time with Mr. T. If he shares the same sentiment is another question completely! I guess it would be hard having your mom teach you all the time. I remember my mom trying to teach me piano and math and I know that I didn't enjoy that. But that was MY mom and she was OLD, so this should be different, right? WRONG! I have to keep reminding myself that it's exactly the same. I have a 5 year-old boy who thinks he knows everything (just like I did at that age…what will it be like when he's a teenager?) and who thinks girls--Mommy included--have cooties. On the up-side, when I hear Tegan talking about President Obama, reciting his memory verses, teaching Daddy a new nursery rhyme, or teaching Mr. Bear about the different landscapes in the US, I know it isn't all that he complains it is. I see all of this and know that I am getting through to him, I know that he IS enjoying school at least a little bit, and that he is starting to love learning. I know that this is a great time of investment and though it starts small, it will blossom into something beautiful. 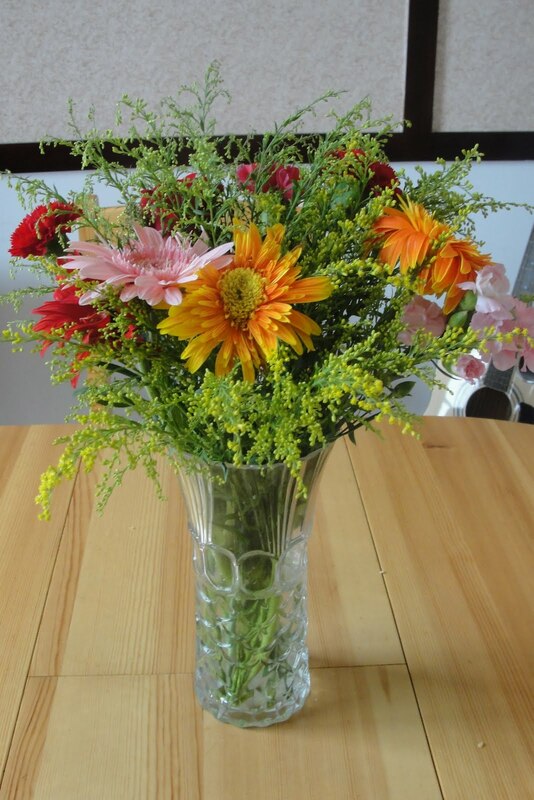 September 10 is Teacher's Day in China, so Preston took flowers to his teachers at his school. When we were buying them, I could see a sadness in Tegan's eyes, because he couldn't buy flowers for his teacher, BUT later in the day he came home with Josh and surprised me with a beautiful bouquet of flowers. So he does love me even when I'm Mrs. Mommy! Hi Renee. I'm Carla. Went to school with Josh at Santiam for a few years. Thanks for sharing some of your homeschool experiences. I just started kindergarten with my oldest child. She also believes she knows everything!